Mars looms just far away from Earth to be an afterthought to most people. Wind twists red sand into small tornados across the endless dry wastes. It is almost bucolic in its stillness, like the unmoving deserts that dot the far-off Earth, and yet something rumbles under its stillness: Unrest. It is 2125, Mars has been bent to the will of man via terraforming, and the red planet is now a mere resource to be mined for corporate gain. Corporate control of Mars is omnipresent and yet it is only ever physically manifested in the power dynamic between the workers of Mars and the corporate-run Earth Defense Force (EDF), which rules the workers with an iron fist. They act as the strong hand that keeps the workers in line—the omnipresent corporate entity made manifest in flesh, bone, armor and trigger-happy fingers. Death camps, hit squads, torture, marshal law: the EDF intergalactic Pinkertons who quell even the smallest notion of resistance with a bullet to the forehead. Mars is a kettle ready to boil. Enter Alec Mason, a man from Earth who has travelled to Mars for good, fair work and to escape the baggage of familial death that weighed him down on Earth. Greeted by his brother (and an EDF checkpoint), Mason breathes Mars’s corporate air for the first time. It is not what he was led to expect. EDF-bent propaganda sold him on a Mars that does not exist, and Mason’s brother says that a resistance is finding its feet. “The people need something to believe in,” he says, as he and Mason drive past an EDF hit squad raiding a house and silencing its inhabitants. It is chaos, albeit of the controlled totalitarian variety. All the uneasiness needs is someone to kick the hornet’s nest and set the red surface of Mars ablaze in the fires of revolution. That is where I, the player, and my avatar Alec Mason come in. In due time, Mason’s brother is gunned down by the evil powers that be and it is here that Red Faction Guerilla truly begins. The core conceit of Red Faction Guerilla is to grow and strengthen the Mars resistance while snuffing out the EDF’s control and influence in each sector of Mars. In order to do so, the status quo must be flipped on its head—via having numerous explosive charges attached to it and blown into a million dynamic pieces. Guerilla sells itself on chaos, on destructibility—like, a lot of destructibility—and it is there, and only there, where it finds success. Its core narrative and the underlying politics are forgotten once the explosions and gunfire start. Yet, the core thematic pulse of a resistance rising against a totalitarian regime can be felt in every action of the game, and that is more due to the real world that Red Faction Guerilla now exists in rather than the game’s world itself. Red Faction Guerilla was originally released in 2009, the year that Barack Obama came into office on the platform of progressive change. One of his first decisions, once in power, was to sign an executive order to close Guantanamo Bay within a year and to prohibit the use of torture in terrorist interrogations. It felt like a future of promise, of hope, with something to look forward to. Yet, 2009 was also the year that San Francisco police murdered Oscar Grant, the U.S. recession was at its worst point in recent memory, and even more troops were deployed into Afghanistan. Also, Guantanamo Bay still remains open, an open wound in the heart of human decency for all to bear witness to, and the revolutionary promise of Guerilla feels as wasted now, some nine years later, as the initial executive push to close that infamous military base/American-branded gulag. Like Alec Mason in Guerilla, who sought to find even the smallest amount of hope on the surface of the red giant that neighbors Earth, the videogame was released into a world where hope was hard to come by; unlike Guerilla, real hope was found in a position of power—in the U.S. president. The chaos found in Guerilla acted as a fun diversion from a world on shaky ground and it offered the tantalizing feeling of fun—it is nearly impossible not to smile as you blow up a giant Mars construct and watch it dynamically crumble to the red surface. Now, it is 2018 and a graphically enhanced version of Red Faction Guerilla, under the woefully bad “Re-Mars-Tered” moniker, has been released into a far different sociopolitical landscape. The White House cabinet is run by a fascistic regime, racism is rewarded rather than quelled, and ICE agents are separating families at the U.S. border as I type this. The horror doesn’t end there—it didn’t even start there, and I could go on and on. Guerilla’s chaos and violence are no longer just fun, but they feel prescient—necessary, even. Building a revolution and enacting political and physical violence against a totalitarian regime and their defense force feels scarily relevant. Given the world that this remaster has been released into, its core themes resonate at a higher decibel—they’re nearly cacophonous. Every gunshot, every explosion and every swing of my hammer in-game feels as fueled by desperation and anger as it does by the promise of hope and a modicum of change. Checking the news every morning as I sip my coffee has become an act of masochism as much as it has been an act to just stay informed. Liberating a fictional Mars no longer feels like escapism, it feels like an exhalation of anger—anger at those whose evil has become the norm and those who’ve sat by the wayside and allowed such a norm to become actualized and cemented in our society. The power fantasy of Red Faction Guerilla feels more like a whimper now, rather than a shot of adrenaline straight to the heart. In-game, walls crumble, the bodies of the EDF lay strewn about, and, warped in the throes of death and the revolution, the resistance is ever-growing. Yet, I didn’t so much as find catharsis in rising up against the EDF as much as I found a new sense of defeat. For every sector I freed from EDF control, I remembered that it is just a videogame and something new to be angry about has happened in the interim between playing the game and checking Twitter/the news. It feels good to liberate Mars, but it also feels meaningless because all of the change I enact in-game is a far cry from the real world. The open-world that was praised in 2009 and the open-ended mission design that was seen as freeing then all feels trite now. Open-world videogames, in the past nine years, have probably evolved more than any other videogame genre. 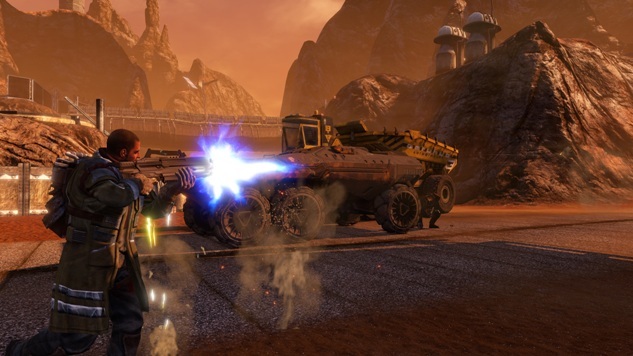 In that respect, Red Faction Guerilla: Re-Mars-tered feels like a definitive product of the past. The open-world is rather empty, the mission design and liberation mechanic breed a feeling of repetition within the first hour or so, and it never fully unpacks its politics— upon release in 2009, it probably didn’t need to. Yet, now its politics and its vision of a future driven by (beyond) late-capitalism feel all too relevant, and the game’s siding with the revolutionary and progressivism feels all too stifled when paired with some rather ill-advised jokes that reek of a “Make Mars Great Again” mentality. For example, a certain character—a gearhead and a mechanic—says “Go Back to Earth!” and “We’re gonna make a new Mars language” and these Trumpian affectations are played for laughs. Now, in 2018, when the U.S. government’s stance on immigration is as infuriating as it is sickening, no one is laughing. Once great and fresh, Red Faction Guerilla: Re-Mars-tered now feels exhausting and trite in its design. The core loop of liberation through complete and utter destruction remains incredibly fun, though, and the unilateral destructibility still feels genuinely novel. Important moments of revolution and history are captured in glimpses of the crumbling monuments of a waning mind-set—for example, the destruction of the Berlin Wall is a physical manifestation of Eastern Europe’s unrest and frustration towards the Soviet Union, and the wall’s destruction remains a mark of liberation in an area where the residual effects of past regimes can still be felt today. Guerillamakes me wonder what will mark America’s liberation from the current tyranny in power—or if a liberation, be it physical or psychological, will occur at all. Red Faction: Guerrilla was originally developed by THQ; the remaster was developed by Kaiko Games and published by THQ Nordic. Our review is based on the Xbox One version. It is also available for PlayStation 4 and PC. Cole Henry is an intern with Paste. He’s on Twitter @colehenry19.